Danbury CT – Danbury Fire Department has frequently provides mutual aid to surrounding towns for emergency incidents of all types. 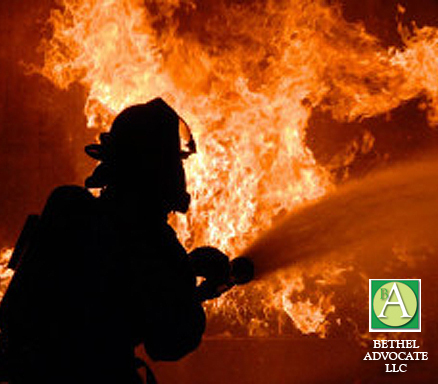 Requests may include fire suppression support and specialty rescue request. Mutual aid is a pre-incident agreement with local, state and federal agencies that is a voluntary reciprocal exchange of resources and services for mutual benefit. Mutual aid has become something we all do more and more to create the best response for the incident in which we are called to. Recently the Danbury Fire Department was requested to Bethel Fire District on Interstate 84 for a rollover motor vehicle accident. Bethel, Brookfield, and Danbury Fire Departments rescue crews worked together to extricate and transport the patient to the hospital. Post incident the chiefs on scene starting discussing the compatibility of their equipment along with what specialty equipment each agency carried. This prompted the concept of a meet and greet. Thursday, area chief officers met at Danbury Fire Training Facility to review each other’s rescue equipment. Rescue trucks were lined up on the fire ground with open compartment doors and one by one the group toured each apparatus. Local agencies have compatible rescue equipment which include air packs, hydraulic tools, and vehicle stabilization equipment. Some had specialty equipment such as a “man-in-machine” kit to remove an object from a person’s extremity or a “Boat in a bag” which can be carried to a body of water and deployed. We would like to thank the Bethel Fire & EMS, Brookfield Volunteer Fire Company, Brewster Fire Department (NY), Hawleyville Volunteer Fire Company #1, Stony Hill Volunteer Fire Companyl, Newtown Hook & Ladder, Germantown Volunteer Fire #10, and Miry Brook Volunteer Fire Company Engine 13 Fire Companies for joining us in learning what resources are available in our region. We hope to hold future meet and greets with other apparatus types (Tankers, Aerials, All Terrain Vehicles, etc) along with hands on training days to create even better working relationships with our mutual aid partners.